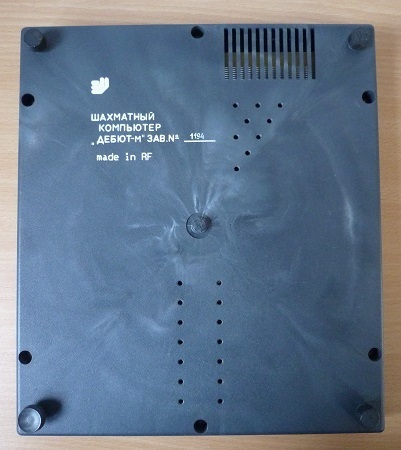 This “Debut-M” was manufactured in 1994 in Moscow by a company called Mosenergo Pribor. 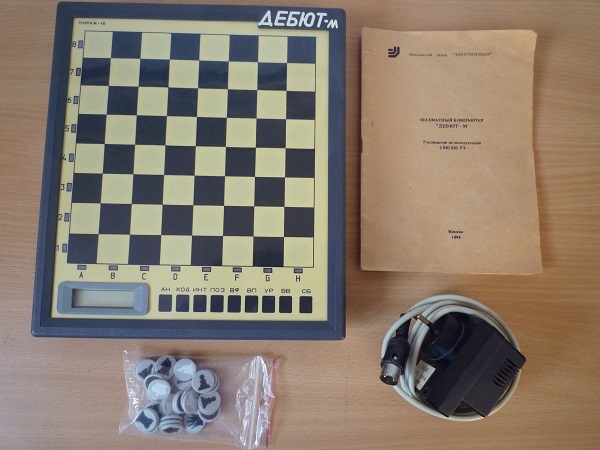 It is an all-Russian product with a program by Vladimir Rybinkin and Yuri Shpeer, both known for their Pentium PC programs Mirage and Dragon which competed at the World Microcomputer Chess Championships in the early/mid 1990s. The processor is a 16-bit Intel 8086 clone and it has 16 KB of program ROM and 4KB of RAM. 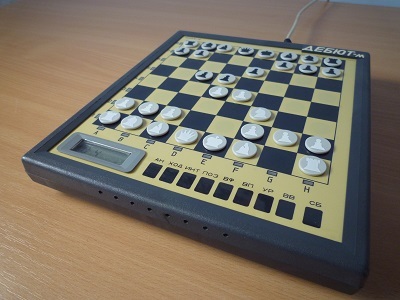 It is unlike any other East European chess computer and not obviously a copy of anything manufactured outside Russia in the early 1990s although its size and basic layout is similar to the Fidelity Chess Pal. 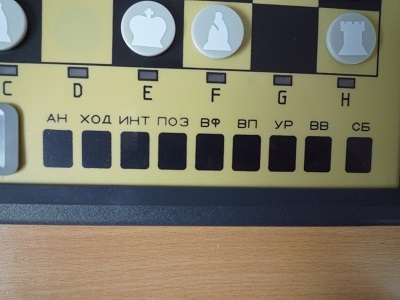 The Debut-M has a press sensory board, nine keys, and is easy to operate. 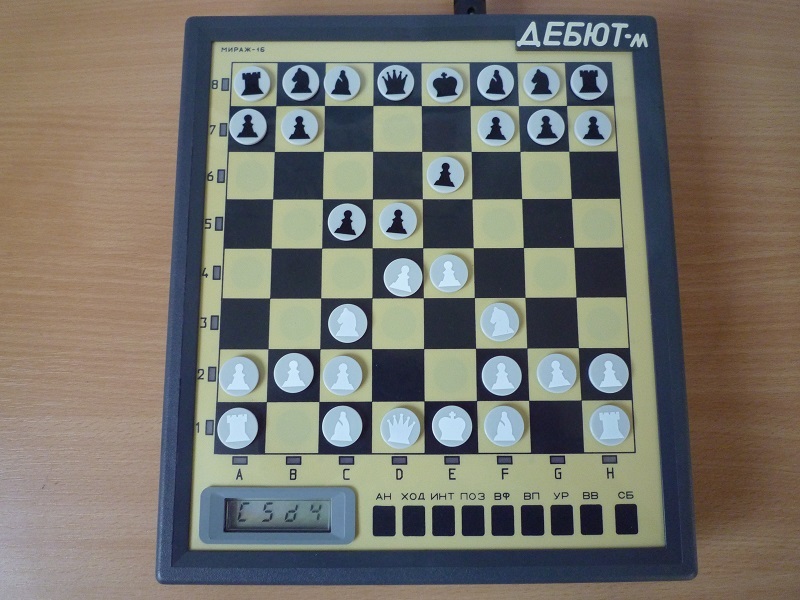 It has 10 playing levels 3-5-10-15-30-45-60-90-120-150 minutes per 40 moves. The LCD display gives information on time, evaluation, depth and main move and there are also 16 edge LEDs to indicate the moves. 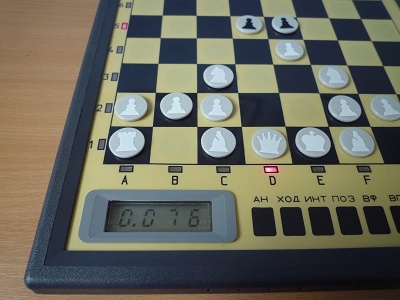 The keys, from left to right, are Info, Move, 2 Players or Human v Computer, Position Mode, Select Piece, Take Back, Level, Halt, and New Game. Debut-M drew 5-5 with Excalibur Grandmaster (Elo 1840) and lost 4-6 to Mephisto MMII (Elo 1834) at Active Chess (All moves in 30 mins). See the links below which also feature Sergei Frolov’s Debut-M which is one of only two other examples in collections that I am aware of. No doubt more will appear in time.